Older adults need to exercise their brain and their body. According to the Journal of the American Medical Association have found with older adults that exercising the brain is as important to keep the brain alert and strong as physical exercise is to keep the body strong and able.The benefits of movement, building, inventing or creating things is fulfilling, and it gives people a sense of worth and contribution while helping them to maintain a positive outlook on life. In the book Successful Aging, John W. Rowe, MD, and Robert L. Kahn, PhD, discuss three aspects of successful aging: low risk of disease; high mental and physical functioning; and being actively engaged in life. Expressive art activities can help promote active engagement in life. And art keeps older adults engaged in life in positive, healthy and fulfilling ways. As we age, cognitive and physical exercise are imperative not only to our health, but to our overall life expectancy. 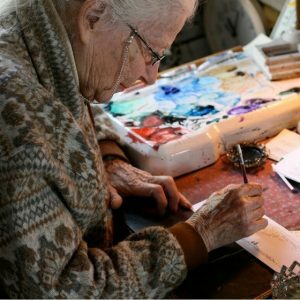 If older adults are experiencing frustrations with the age-related decline in his or her physical abilities, creative arts programs can provide them with an outlet for expressing their feelings in a positive way. Participatory creative arts programs also can lead to an increased sense of well-being, as well as decreased rates of psychological issues such as depression. How has art impacted your life? Share your comments below or join our conversation on Facebook. If you’d like to learn more about our Companion Care Services – like taking your loved one to his or her favorite art class – contact us today. Over the past year, we’ve worked extremely hard to build an article that is accurate, easy to read, and has beautiful photos about a topic we feel very passionate about: how crafting is good for your health! We believe it’s a wonderful, inspiring article that will truly help people find motivation and purpose in their creations. It literally covers everything from understanding how creating can counterbalance a modern lifestyle with a lot of screentime, what ways screentime can adversely impact us, reasons creating handmade items helps, and more. This article contains up to date research and, like all of our articles, we update it as-needed to ensure it always has the most relevant information! Hi Sarah, thanks for your comment and information. We will contact you directly about this.